This may sound conciliatory and annoying, it's not meant as such but I think that bat is really rather wonderful. I'd be absolutely thrilled to bits if someone hand-made me a bat. I like bats. It's a disabled bat. Obviously. Nothing wrong with that. Yeah, I think the bat AND the shirt rocks! I mean, hey, I had to sleep at my grandparents under a victorian painting of "the poor gypsie girl" whose eyes would glow in the dark - your bat is way more huggable and way less freaky than that - and the t-shirt for some reason makes me think of "giant purple people eater" (though it is not purple) - which is a cool song to sing (about 200 times) until your parents beg and then order you to never do so again. Love the room sign myself. I'm with Elizabeth on the purple people eater. Alexander will be growing up with so much cool artwork. Where's he going to put it all? All of these things are perfectly adorable. I especially love the bat. I hope you go ahead and give them to him. My 3-year-old says, "Is that mine bat? Can I have that bat, mama?" There's you go. the Judgment is final. the bat is going to get loved and chewed to shapelessness anyway. The important bit is "Auntie Goldfish specially made toys just for you and no one else", not "Auntie Goldfish makes toys that are indistinguishable from the shop-bought variety". As for the t-shirt, it is clearly a slime monster and as such, is sliming. Not that anyone will notice when it is (a) wrapped around a child rather than spread out on a table, (b) has the cuteness of Alex's grin on top of it to distract attention, and (c) is covered in chocolate dribble, blackcurrant squash dribble, and unidentified dribble after thirty seconds of wear. 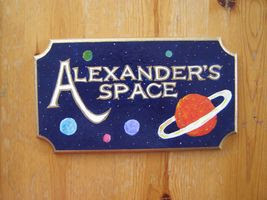 PS that is a stunning door plaque. Very late last night I tried to watch a TV program about J.W.M. Turner, wot painted some pretty pictures. Seems he also had a darker side the results of which have been mostly kept hidden Paintings with scenes of terror and considered to carry grand messages about life and death and man's inhumanity to man and all. This is the cutest bat ever - in colour as well as in black and white. 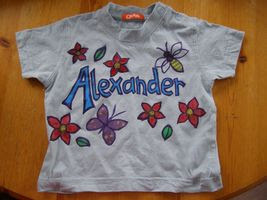 Alexander will love it! Thank you so much everyone! You are all very kind, if having dubious aesthetic tastes. 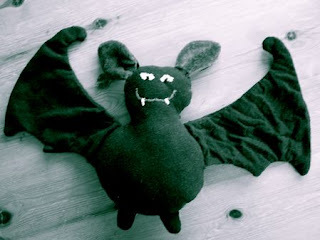 If Becca or Sage's little one would like me to make them a bat, I would happily do so, although I must warn you that my next attempt at bat-making might produce a bat or superior quality, which might therefore lack some of this bat's alleged charm. Elizabeth, I now have to hunt down the Purple People Eater song... Mary's slime suggestion is a good one and yes, Nobby, I'm sure what I was trying to say with the bat was something about the deep existential paradoxes of the human condition (or some such, with lots of syllables). Random note: idiot software thinks I've misspelt favourite. And misspelt. I would absolutely LOVE a bat. Can I give you some money for materials or owt? hi, you've got great posts in your site. gotta give you credit for that. 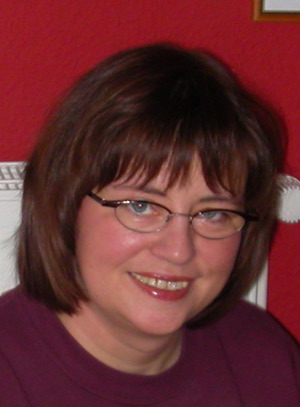 found me some articles too in your site i think are worth bookmarking, thanks. keep it up.